Pickathon, the idyllic, eco-conscious music festival that takes place each summer outside of Portland, Oregon, is only days away - and this year's stage was built by students. 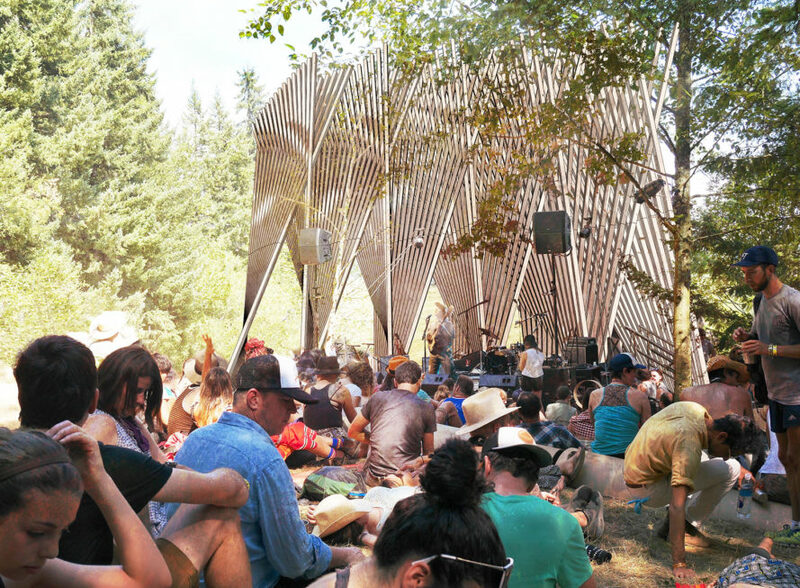 Pickathon commissioned 8 Portland State University students to dream up a new recyclable Treeline Stage. The students chose one the world’s most often used and well­-loved materials, the trusty 2x4 wood stud, to create a dancing, fan-like structure for performers. A classic example of diversion architecture, the beautiful stage complements the trees and swaying meadow grasses of Pendarvis Farm. For the past 16 years, over the first weekend in August, a carefully curated lineup of talented bands from all different types of genres descend upon the gorgeous Pendarvis farm to make and share awesome music. People gather on the gentle slopes of Pendarvis, setting up campsites throughout the property and then spending the weekend floating throughout the many different environments the festival has to offer. The options for performances, fresh food, craft beverages, kids’ activities, and art are basically unending. Meandering paths connect six unique venues together, from cozy converted barns, to sunny grassy meadows, to a hammock-­filled dappled forest grove. One of the many ways Pickathon is doing things differently than the average music festival is through an annual collaboration with Portland State University’s School of Architecture on a concept called the “Diversion Design Build.” It aims to demonstrate that collective gatherings don’t need to create huge carbon footprints in order to be powerful. Thoughtful design can easily outshine excessive extravagance in the creation of elevated group experience. 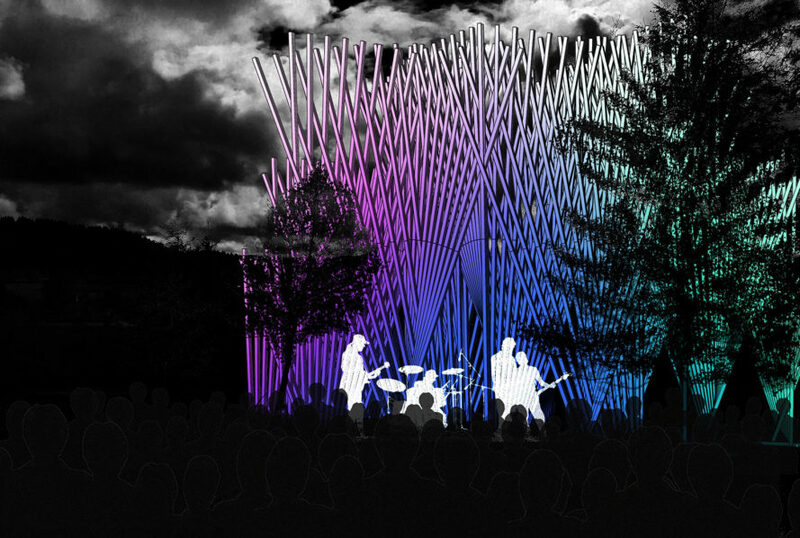 This year Pickathon asked 8 PSU students to design a new Treeline Stage which includes the same 1,000 person audience area as last year, as well as a bigger and better surrounding beer­ garden, dining area, and lounge and media viewing zone. The students hit the ground running, throwing tons of wacky, clever, and unusual material ideas on the table for discussion. A few of the more memorable visions included suspensions of thousands of recently used wedding flowers in a scaffolding framework, sculptural aggregations of large­ scale salvaged farm equipment, or monumental stacks of used vehicle tires, cable spools, or apple crates. Whether or not they’ve ever driven a screw or hammered a nail through one, just about everyone’s familiar with a 2×4. It’s a common object that people associate with building, but most likely with the unfinished, less aesthetically pleasing part of the process. The rough, splintery boards are typically hidden behind layers of siding, shingles, plaster, or sheet­ rock. The team agreed it could be a very fruitful design challenge to incorporate them into this design. After careful consideration, the students were able to give this simple material a moment in the spotlight. Using thoughtful design and clever tectonic articulation, the students created almost organic-seeming curves out of a series of straight lines. Stay tuned for the reveal of the final design. One of the many ways Pickathon is doing things differently than the average music festival is through an annual collaboration with Portland State University’s School of Architecture on a concept called the “Diversion Design Build.” It aims to demonstrate that collective gatherings don’t need to create huge carbon footprints in order to be powerful. Thoughtful design can easily outshine excessive extravagance in the creation of elevated group experience. A wood model shaped during the students' design process. The structure shows that thoughtful design can easily outshine excessive extravagance in the creation of elevated group experience. This year Pickathon asked 8 PSU students to design a new Treeline Stage which includes the same 1,000 person audience area as last year, as well as a bigger and better surrounding beer­ garden, dining area, and lounge and media viewing zone. 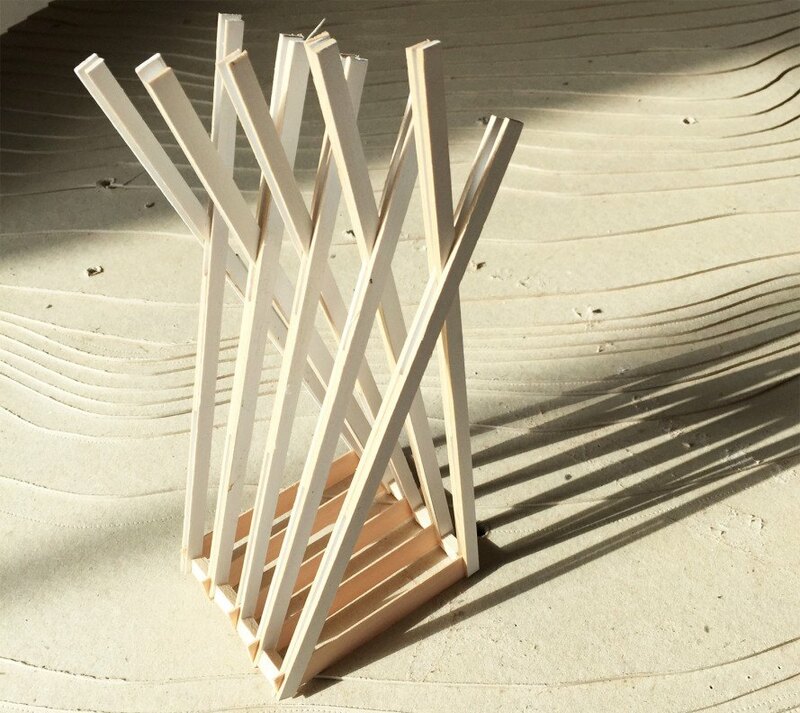 After careful consideration, the students were able to give this simple material a moment in the spotlight, using thoughtful design and clever tectonic articulation.